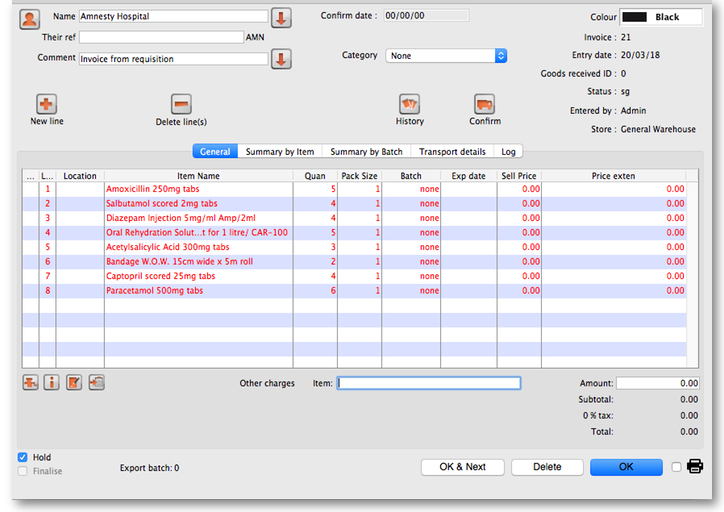 The imprest module allows a pharmacy or warehouse to decide on quantities of drugs its receiver facilities (customers or Virtual stores) should receive. Periodically a stock take is carried out at the customer's site and drugs are replenished to meet the predefined (imprest) level. The tutorial below suggest how an imprest should now be carried out. Select Item > Show Item master list… from the menus to create a master list (see here for details). Assign the master list to the customer. 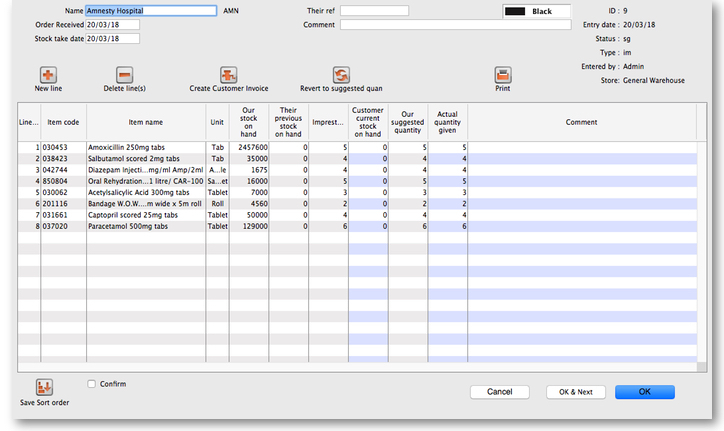 See Item Lists > Assigning a list to a customer for instructions. Click on ‘Requisitions’ in the ‘Customer’ (or Patients) tab.. Click on the New customer imprest icon in he window which appears. Type the first few few characters of the customer name in the Name field and press tab. A List of matching customers is displayed (unless only one customer name matches what you entered). Choose the intended customer and click the Use button. At this point the master list of items associated with the customer is displayed in its default sort order. The image below shows an example of what you now see: a list of items with their required imprest quantities. The next task is to print the list and carry out a physical stock take at the customer site. First of all, make sure the list is in the correct order. If it is, fine. If not, re-order it as appropriate (by clicking on the column headers or dragging items up or down the list) and click on the Save Sort Order button. Now print the list by clicking on the Print button and selecting the “Customer stock takes” option. The print dialogue opens. Here you can add header and footer information for your printouts. Press OK when ready and print the list. Please note that after printing the list you should not re-order it - it will be confusing later when you come to enter the counted quantities for each item. Now, using the printout, carry out the actual stock take. After carrying out actual stock take at the customer's site it's time to enter the actual stock quantities. In the window displayed below, edit the value in the Customer current stock on hand column with the stock take quantities you've written on the print out for each item. mSupply automatically completes other two columns (Our suggested quantity and Actual quantity given). All the entries appear in red - they are placeholder lines which have the correct quantity but have no batch chosen (notice 'none' in the batch column for each line). 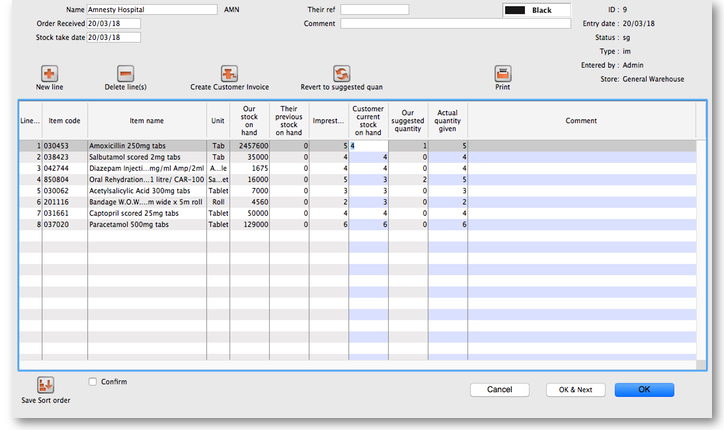 You have to double-click each line in turn and select which batches you wish to assign to the customer. When you've selected batches for every line, make sure the Hold checkbox is not checked then confirm the invoice to assign the stock to the customer. Now all you have to do is print off the pick list, physically pick the stock off the shelves and send it to the customer. Congratulations - job done!